What will it take to achieve Obama's climate targets? The ambitious targets announced by President Obama for reining in greenhouse gas emissions are well within reach, many environmentalists say, and can be achieved without the help of Congress, which has shown little appetite for tackling the problem. 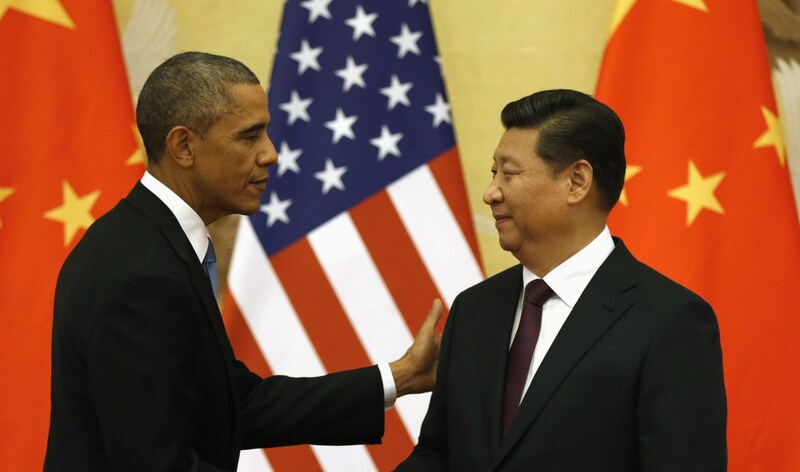 In what Mr. Obama described Wednesday as a "historic agreement," the United States agreed to deeper cuts and China pledged to cap its emissions. The move, especially from China, is expected to energize international efforts to reach a deal next year in Paris to reduce emissions beyond the year 2020. Environmental groups said the U.S. target of reducing emissions 26 to 28 percent from 2005 levels by 2025, could be done with many proposals already floated by the Obama Administration. The new targets will keep the United States on a trajectory to achieve reductions on the order of 80 percent by 2050. Central to Obama's plans are new rules announced in June from the Environmental Protection Agency that mandate a 30 percent reduction in carbon emissions at power plants that burn fossil fuel by 2030. The EPA would set the carbon dioxide emission goals, but over the next two years states would determine how they would make those cuts. On top of that, the EPA is considering regulating methane emissions - whose impact on climate change is 20 times that of carbon dioxide over 100 years - from the oil and gas sector. It also is supporting an international agreement to tackle HFCs, chemicals which are used mostly in air conditioning and have high global warming potential. "Our take on the 26 to 28 percent based on the preliminary work we have been doing is that it's an ambitious but reachable target by the United States," said Kevin Kennedy, director of the World Resource Institute's U.S. Climate Initiative in the Climate and Energy Program. "It will take the United States acting on the emission sources in all these different sectors. They won't be able to pick and choose. They really need to go and look for the cost effect opportunity across the economy to reduce emissions." Jake Schmidt, director of international programs for the Natural Resources Defense Council, agreed it was doable but said deeper cuts will have to be made in the power sector. "We'll be making the case in our formal comments later this month that deeper cuts can be achieved in the electricity sector by greater us of energy efficiency and renewables, and that these tougher efforts are cost-effective," Schmidt said. "It also means that the next Administration will have to continue to use all the tools available to meet the target. The President has all the tools that they need under existing law to meet this target." Others said Obama should be helped by current trends that have seen the United States shifting to cleaner burning natural gas thanks to the shale boom. Renewables such as wind and solar, too, have come down significantly in cost and are much more widely available than even five years ago. According to Federal Energy Regulatory Commission, operating renewable generating capacity as of September was up 4.5 percent from a year ago. The growth is even stronger when looking at new generating capacity, which jumped nearly 12 percent. Energy efficiency, too, appears to be gaining traction with everything from green buildings to fuel-efficient vehicles becoming more widespread. Last year, automakers raised the fuel efficiency of their new models to record levels, 24.1 miles per gallon, according to the Environmental Protection Agency. Further down the line, President Obama has proposed doubling standards to 54.5 miles per gallon for cars and light trucks by 2025. "I think it's doable but I think we will need to help push it along," said Carol Werner, executive director of the Environmental and Energy Study Institute. "I don't think it means sacrifice. It means doing things better," she said. "That has benefits for Americans and for American businesses because it can make us much more competitive in global economy." And while a Republican-controlled Congress isn't likely to make climate change a priority, environmentalists said there is no reason it can't find common ground on the issue at some point in the future. However, that doesn't seem likely in the near term, considering Senate Minority Leader Mitch McConnell (R-Ky.) and House Speaker John Boehner (R-Ohio) were among the first to criticize Obama's climate deal with China. It could, for example, pass revive the Energy Savings and Industrial Competitiveness Act which aims to spur the use of energy efficient technologies in residential, commercial and industrial sectors. The bipartisan bill was abandoned this year after GOP leaders tried to force votes on other energy related amendments. It could even reconsider putting a price on carbon - a concept endorsed by the likes of the World Bank, 1,000 companies and 73 countries. Long derided by Republicans as a carbon tax, supporters said pricing carbon could spur investment in clean technologies and speed up a shift away from an economy dependent on fossil fuels. "This target, this number came out of what the White House can do with existing laws in place," said Nathaniel Keohane, vice president for international climate for the Environmental Defense Fund. "That is good but to do more we are going to deeper reductions over time. We are going to need action by Congress. That will take a national conversation and bipartisan solutions."